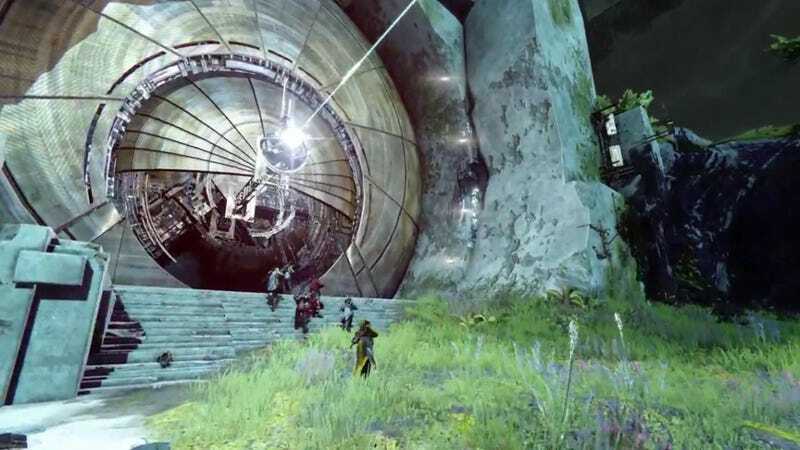 Destiny's first ever raid is not—by any stretch of imagination—a cakewalk. For one, the raid is obtuse and frequently merciless, and for two Destiny is sadly bereft of cake. Unless you are these people, it's probably giving you fits. I decided to ask the first clan ever to beat it for advice. Here's what they said. It sounds obvious, but the simple act of survival is rule number one for our raid group and the importance of the concept really can't be overstated. Even a lone person dying has serious effects on your entire team! On normal difficulty, it's at least 30 seconds' lost damage, which can make the difference between winning a fight and being overrun; on hard difficulty, it's a lot more than 30 seconds. How does this manifest itself in fights? Try to minimise risk where possible in your engagements. This includes basics like having solid cover to hide behind and not running into open ground, but also things that require a lot more experience and judgement, like knowing exactly how much damage you can safely deal and take or being consistently aware of enemy snipers/heavies and their lines of sight. Most raid groups are aware they need to be talking to each other pretty much constantly, but what you choose to communicate and how you do so are big distinguishing factors between the best and the rest. Top-end raid groups don't just have a raid leader barking instructions—they have a complex combination of enemy type and position callouts, people saying when they're in immediate danger, when they will need help soon and when they need to change tactics. In order to stop the party chat descending into chaos, all these things need to be explained concisely. If you see Fanatics spawning from the cave at the back of the Templar fight on the right hand side, "Fanatics cave right!" will do. It's a brief, informative callout and in a game where it's impossible to see everywhere, it keeps everybody on the same page. Make sure you develop a system to accurately and quickly call enemy positions. Your special weapon is just that: it's a niche weapon for specific situations (whatever Rumble players in Crucible would have you believe). Take the Shotgun, for example. It has a very high and quick damage output at close range compared to the slow burn of a primary weapon, so you'll want to save it for enemies which need to be finished quickly—try darting in and out with a Shotgun to finish off a half-health Praetorian without taking melee damage. Similarly, sniping a Goblin is a lot less useful than sniping a more dangerous Hobgoblin. Matching the ammo to the enemy is key. A complaint I heard a lot when following threads on Reddit after I'd completed the raid was "how the hell do you kill Praetorians?". Praetorians are an example of an enemy that isn't designed to be killed quickly by a single player. If you have to take one on your own, it's going to be a long fight and you might not survive (see point 1). When a particularly beefy or important enemy spawns, our group will frequently drop what they're doing and have two or three guys focus fire on it—even from across the room if they can. Better that you take a few seconds out from killing Goblins than your friend gets crushed by a Praetorian! We consider Templar and Atheon as being two fights each for a total of four encounters; the shield relics show up in the second, third and fourth encounters and have a variety of uses. Firstly, you can attack with them by firing and if you fire while in the air, you'll do a Death From Above style area attack. They have a separate super which can be used in the second encounter to temporarily take down the shields on the boss. Thirdly, they have a cleanse function (used by holding the grenade button) which removes harmful debuffs like Marked for Negation and Marked by the Void on nearby players. Finally, if dropped and left on the ground, the shield will explode after 4-5 seconds, killing everybody on your team! If you're feeling particularly adventurous and need extra damage on a boss, you can "juggle" the shield by dropping it (use the Switch Weapon button) then firing for a bit and picking it back up. You have to be careful with this method though—we've had a few embarrassing deaths where I've forgotten to get back to it. It helps to have clearly defined subgroups of three and two within your raid team to allow you to quickly split up and move around, because most of the encounters are roughly symmetric rooms with two clearly defined sides. Our world-first team was made up of three Brits and three Americans, so naturally we had Team UK and Team US (these actually became callouts we now use regularly). Whenever it became apparent we needed to split into three pairs, we had partners to follow. Having these general partner and group systems in place from the start allows you to quickly divide on the fly as you progress through the raid; eventually, it becomes second nature. There are three main buffs or debuffs in the raid; Marked for Negation is the first and applies in the first and second encounters. There are two ways you can get this debuff—either by stepping in the green pools left behind by the Fanatics when you kill them, or leaving an Oracle alive for long enough (which will give the debuff to your entire team). When the Templar casts Ritual of Negation, it will kill anybody with the Marked for Negation debuff and remove all Fanatic pools. In the first encounter, the only way to remove the debuff is to run into the light in the middle of the room. However, use the light too many times and it will disappear—so try not to stand in the green stuff. In the second encounter, Marked for Negation can also be cleansed using the shield relic—although doing this when your entire team has the debuff does require a lot of movement, so try to kill the Oracles promptly. The Templar fights are really just a check to make sure you're an organised, co-ordinated group. The best way to deal with Negation is to not get it in the first place. Marked by the Void is the second important debuff and applies in the third and fourth encounters. We refer to the area through the Vex timegates in these encounters as the Void Zone. The first time you go through either Vex timegate, you'll see a heroic enemy called the Gatekeeper. There are two timegates, so there are two Gatekeepers. From the moment either of these two Gatekeepers is destroyed, anyone inside the Void Zone at any time becomes affected by Marked by the Void, a particularly nasty debuff which makes your vision slowly disappear. The only way to remove Marked by the Void which doesn't involve dying is to cleanse it with a shield relic, so anyone who goes into the Void Zone will need to communicate with the player holding the shield relic when they need to be cleansed. Make sure to cleanse again when you leave the Void Zone; you'll still have the debuff. The final important buff, Time's Vengeance is a 30-second buff which gives a massive damage boost. It's only present in the fourth encounter, against Atheon. Periodically, Atheon will "open the timestream," teleporting the three players furthest away from him to the Void Zone. When this happens, a number of Oracles will spawn inside the Void Zone. If the three players in there kill all the Oracles before leaving, all six players in the raid will receive Time's Vengeance. This buff is essential to killing Atheon before his enrage kicks in and you get overrun. Above all else, have fun and remember it's a hobby, not a job! Keep things light when you're raiding; it can get stressful and you can spend a lot of time respawning, but if you're with a group of friends and you keep things good-natured it's an absolute blast. Best of luck in the Vault! Thanks for the tips, Matthew! If anybody else has any crucial advice for the raid, feel free to pipe up below. Perhaps with your help, everybody—for example, Kotaku's own Kirk Hamilton—will be able to crush the Vault of Glass and finally stop asking about it in chat.